This entry was posted on Thursday, July 11, 2013 at 2:08 pm	and is filed under Field Notes 2013. You can follow any responses to this entry through the RSS 2.0 feed. Both comments and pings are currently closed. In excavating the Minoan site of Zominthos, you mentioned finding a possible central water system. 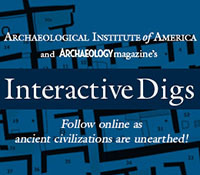 In your 2013 study, did you unearth any bath houses or hygeine areas that the Minoans would have possibly used to stay clean and heal their bodies from possible diseases and sicknesses? Are these walls the same as when they were first discovered? I am curious about the mortar that was used: was it put there to stabilize it when it was discovered or did the Minoans seal their walls with it?